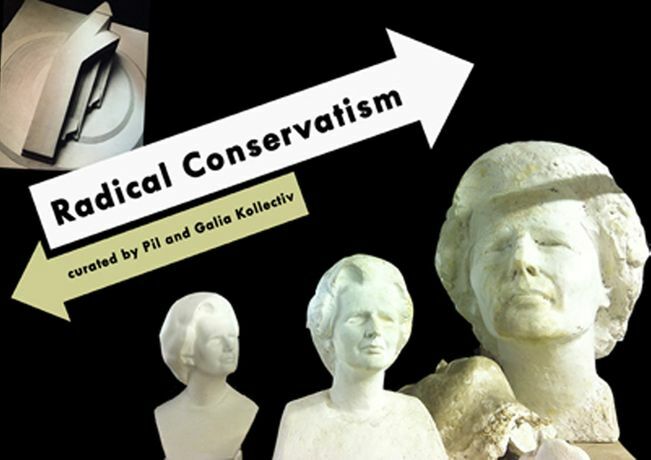 Join the curators of the Radical Conservatism exhibition, Pil and Galia Kollectiv for an informative gallery tour. More on the exhibition In 1938, Yugoslav sculptor Oscar Nemon arrived in Britain, having fled the Nazi invasion of Brussels, where he was living with René Magritte. He was part of the European avant-garde and came to the UK as a refugee. Shortly thereafter, Nemon proposed a bold architectural plan to construct a temple of universal ethics in London and was in correspondence over this with central figures in Britain. After the war, he became known for his portrayal of figures like Churchill, culminating in a bust of Margaret Thatcher that is currently at the Tory HQ. Radical Conservatism, curated by Pil and Galia Kollectiv, explores the space between these two moments and asks whether these two terms are really antithetical. In the British context in particular, where the European avant-garde never really took hold, a kind of reactionary modernism has always defined a culture wary of revolution. But today more than ever, with the left increasingly holding on to the past of the welfare state as an ideal, and the right quietly revolutionising our world through neoliberal reforms, the paradigms of radicalism and conservatism need to be redefined. Can conservatism be seen as a radical position in itself? If art is defined by a movement towards the new - could 'holding on to the past' stubbornly be seen as a critical position, now that neo-liberalism has forced a far more radical shift in politics than the left has managed in a long time? Pil and Galia Kollectiv are London based artists, writers and curators working in collaboration. Their work addresses the legacy of modernism and explores avant-garde discourses of the twentieth century and the way they operate in the context of a changing landscape of creative work and instrumentalised leisure. Pil and Galia Kollectiv's prints from their Future Monument series present proposals for a monument to the future crimes of capitalism inspired by the form of the yacht. It has often been remarked that the late capitalist operations of financialisation have no concrete visual language. Global finance is a liquid, smooth motion that paradoxically de-territorialises and concentrates wealth like a swarm of fractional arithmetic components, both menacing and immaterial. But if its true nature is an elusive, constantly mutating entity, then yachts serve as a fictionalization of its core essence, a testament to the conditions under which we live. As repositories of capital, they are fascinating because they make concrete the invisible flows of finance. Their display of power and status is inverted in their sheer visibility. Ignoring what goes on inside, we are treated to a spectacle of architecture in motion, evoking the impermanence to which the postmodern monument aspires.